What makes a good map? How should it be formed to guide us through strange terrain? Naturally, it should be abbreviated, compacted, abstracted to a certain degree; a map as big as the land it describes is useless. Crucially, its shape should echo the shape of the land as closely as possible. In mapping the complex history and experience of psychoactive plants, Dale Pendell uses a type of abstraction-to-a-grid that echoes conventional geographic mapping. Here, he adapts Louis Lewin’s five-fold categorizing of “mind plants”, fronting the work with a tantalising pentagrammatical map that give us these organisational nodes: euphorica (e.g. opium), phantastica (e.g. peyote), excitantia (e.g. coffee), thanatopathia (tobacco), and inebriantia (e.g. wine). Rogue substances bridge the pentagram’s points like the Major Arcana creating paths between the sephiroth on the Tree of Life; for instance, Datura spans the space between the visionary phantastica and the death-brushing thanatopathia. Crucially, Pendell’s text follows a course as overtly labyrinthine and disjointed as an evening’s tour through the intoxicants described would be. Indeed, his avowed methodology of “immersion” means that each plant’s chapter is subtly (or not so subtly) tinged with the influence of the author being “under the influence”. The plants are co-authors, shadowy ghostwriters and editorial consultants. Equally essential to this book’s triumph in mapping these many-dimensional regions to the linear flow of the printed word, is the seductive sense of deeper structures woven into the work. Each chapter unfolds in a dance between various headings, some repeated as different facets of the plant in question are revealed from different perspectives. Familiar information such as “Common names”, “Taxonomy” and “How Taken” are spiced with hip jokes with an educational remit; less orthodox sections titled “The Ally” snake through the text, constantly referring the wealth of information back to the underlying animism of this project’s goals. Occasional lists of “Correspondences” range again from the routine esoterica (“animal”, “element”, “gemstone”), to apparently bizarre scientific tangents (“logical operator”, “physical constant”), to the profoundly edifying (“crutch for”, “form of ignorance”). I don’t know enough about opium or physics to know whether the former corresponds to the “Quantum Force: Neutron”. But the book is so on-the-mark in all disciplines I’m familiar with that these odd hints sit there, teasing your mind into acknowledgement that there’s always more at work here than you know about. It’s abundantly evident even from a cursory read of this tome that Pendell is uniquely qualified. His firm grounding in botany, biochemistry and neurology, the grasp of abstraction that his work as a software engineer affords, and his long experience of home experimentation, mean that science is well represented here. 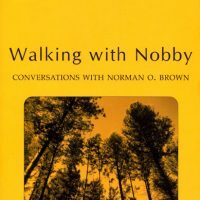 But his status as a poet and spiritual trickster mean that science is wielded as a tool, not subscribed to as a faith; all is framed by the knowing, wit and humility of lived experience, faithful attention to anomalous detail as well as broad, subtle trends. 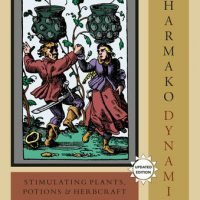 It grows clearer and clearer as you sink deeper into this enchanting work—magnificently produced to both honour and twist the design traditions of the Renaissance herbal—that here is a guide to the plants we use to alter consciousness at once more honest, funnier, and more useful than any combination of dry scientific data and morally suspect government-generated information. In this first of three volumes we meet a fascinating array of characters, from the too-familiar players such as alcohol and tobacco (whose general invisibility to us is remedied with juicy details from their strange, world-shaping histories and religious uses), through regulars such as marijuana and nitrous oxide, to obscure bit-parts played by bulrushes. 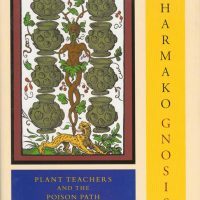 The primacy of the plant world is invoked persistently, the lineage of each artificial concoction rooted firmly in the fantastically complex world of these biochemistry gurus. And, as befits a work of such integrity, even the publisher’s name (Mercury House) reflects an essential aspect of the approach. 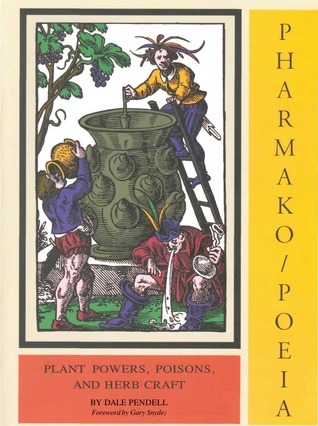 The Greek pharmakon, used by Plato to mean (among other things) both “remedy” and “poison”, is the umbrella under which Pendell collects the elements of his quest: “the Poison Path”. Paracelsus famously highlighted the role of dosage in deciding whether a substance is toxic or beneficial; Pendell extends this principle to the slippier axes of cultural status, set, setting and intent. He sings the praises of the plant powers (sometimes literally, in shrewd, strong verse), but certainty and security are dispelled as illusions. The extreme importance of safety is taken for granted (though re-stated here and there for good measure), but the irreducible risk of healing and adventure through intoxication is central. Uncertainty abounds, and it’s wise to always pay tribute to the tricksters who guard the intersections that make any true path crooked. Pendell honours Hermes most thoroughly, through a wayward style, liberal use of quotes from others, and a combination of boldness in stepping over boundaries, and persistent respect for the dangers of the unknown. Even the commentary on the References section is a treasure: a digestible guide to the subject’s literature, full of personality and dry humour. Like Terence McKenna’s Food of the Gods, Pendell’s trilogy promises to unravel your preconceptions about the role of plants in human life. Unlike McKenna’s brilliant but inevitably flawed work, which re-visions our image of history around our interactions with plant chemistry to create a bold new emphasis that is bound to falter in its details, Pendell works in a more carefully particular, less declamatory mode. He has the open-hearted suspicion of the modern world that marks all good poets, but his occasional attempts to sketch coherent images of history, seen through the lens of our alliance with plants, are most often pithy asides, wry quips. That plants are significant powers is drawn out clearly; but there’s little presumption to grasp the total shape of their projects. McKenna walked a tightrope between humanist exuberance in the power of our species and animist deference to the larger system of nature. Pendell—while being very, very far from lacking exuberance or concern with power—sides with the animists, it seems. For a book on plants, this is a greater boon than anything else. Surely one of the most nutritious, juicy, and delectably poisonous works on plants and drugs you could wish for. See also Pharmako/Dynamis and Pharmako/Gnosis. Pharmako/Poeia by Gyrus is licensed under a Creative Commons Attribution-NonCommercial-NoDerivatives 4.0 International License.